Ray Of Light, Madonna's first studio album in four years, marked the singer's return to pop music after a detour that took her from Argentina to motherhood to spiritual reawakening. After reuniting with longtime songwriting partner Patrick Leonard (who played a key role in many of Madonna's greatest songs and whose contributions to this, her eighth album, are often overlooked), Madonna called on U.K. electronica whiz William Orbit to assemble a batch of songs that nimbly married electronic music with pop. With "Frozen," the album's first single, Madonna, Leonard and Orbit crafted what can only be described as one of the great pop masterpieces of the '90s. Its lyrics are uncomplicated but its statement is grand: "You only see what your eyes want to see/How can life be what you want it to be?" The song's bewitching melody and cinematic string arrangement is pumped up with Orbit's expressive drum fills and pulsating electronic effects. Tracks like the frenetic "Skin" and "Shanti/Ashtangi," a Yoga techno prayer only Madonna could pull off, are similarly lacquered with a bubbly electronic sheen. But for all the studio gimmicks, there's a healthy spoonful of live guitars and percussion thrown into the mix. Orbit's cycles of analog synths and electric guitar licks perfectly supplement the elasticity of Madonna's then-newly-trained vocal chords. Like no other Madonna hit in recent memory, the title track found the singer in a celebratory tech-frenzy. Whether it was an epiphany of the spiritual or sonic kind (Ray Of Light marked a dance-rooted homecoming for the pop star), her elation was unmistakable: "Quicker than a ray of light, I'm flying...And I feel like I just got home!" Though she's made an entire career out of revealing herself, Madonna hadn't been this emotionally candid since Like A Prayer. Layered with vocal samples and buoyant drum n' bass beats, "Drowned World," the title of which was inspired by J. G. Ballard's apocalyptic novel of the same name, sums up much of Madonna's personal tribulations with fame: "I got exactly what I asked for/Running, rushing back for more...And now I find, I've changed my mind." "Mer Girl," the album's final, spooky offering, is a surreal meditation on mortality and the death of the newly-dubbed Ethereal Girl's mother: "The earth took me in her arms/Leaves covered my face/Ants marched across my back." 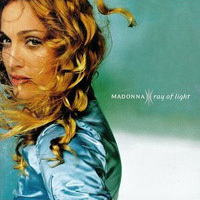 But while time has yet to leave its mark on Ray Of Light the way it has True Blue and Erotica, it's difficult to tell how the album will hold up in years to come. Single Review: Janet Jackson, "No Sleeep"